This nation's tuition arms race seems to be costing parents an arm and a leg, and children their play time. 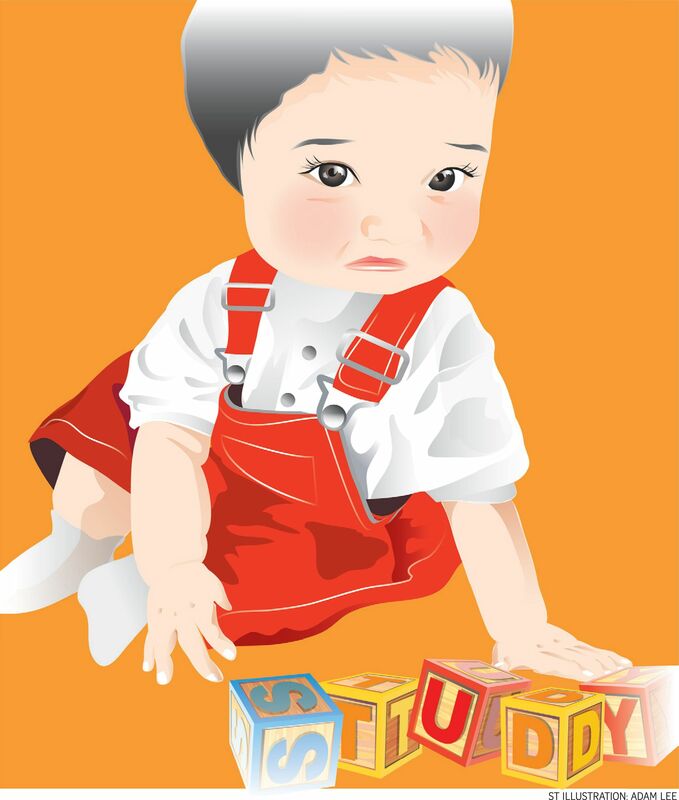 According to a recent survey of 500 parents by The Straits Times and research company Nexus Link, nearly eight in 10 parents with children in primary school pay for private tuition, while more than six out of 10 parents with secondary schoolchildren do so. While parents have every right to decide how they want to spend their money, I would like to make a pitch to protect children's play time because everyone needs to play. It is part of being human. The irony is that in rich societies like ours, people increasingly see play time as a luxury they can ill afford. But if too many of us get too caught up in the belief that time - including children's time - must be spent productively in pursuit of better performance, whether in academic subjects or sports or the arts, then we may start to forget not just how wonderful it is to play but even how to play. Wouldn't it be tragi-comic if one day, we have to go overseas to relearn the skill of play from children in foreign lands who do it naturally? When I recall my childhood, my most vivid memories of primary school are of recess time, when we played rounders and green spot in a huge school field, hop scotch under the yellow flame trees that lined one side of that field and a game called AEIOU on the steps that took us from our classrooms to the same field. I did not excel at any of those games, quite the opposite. I had a strange habit of daydreaming while playing catcher (or fielder) during rounders, which frustrated my playmates no end. I am thankful they still let me play with them. Once while I was daydreaming, the ball hit by the batter actually flew and landed in my palm - which meant the opposing team was automatically out. That may have been an early lesson in accepting one another - quirks and all - and in how even the most unpromising of team mates can surprise you by helping you clinch a game. I also remember school holidays spent in chalets by the beach in Changi and camping trips to Coney Island with my parents, aunts, uncles and cousins. We children would spend the whole day playing in the sea, with short breaks for food. I remember the time a school of flying fish came by when we were in the water. We hugged each other and shrieked in delight, especially when one or two fish darted into our open mouths by mistake and out again. But the space and time for such unstructured enjoyment of the outdoors and the company of family and friends seem to be shrinking fast for this generation of children, whose after-school hours and weekends tend to be packed with tuition and enrichment classes. There's nothing wrong with wanting children to learn as much as they can. My only plea is that families still set aside time for kids to indulge in unstructured, self-directed play, where they are free to decide how they want to spend their time. Some scientists in America have in recent years studied the effects of play deprivation in animals. They believe that among social mammals, the biology and neuroscience of play shows it is an activity that is "fundamental" to their survival. That puts play on a par with eating and resting. In controlled laboratory settings, play-deprived animals were found to be unable to deter aggression or to socialise comfortably with fellow pack members. These findings have paved the way for growing interest in the study of play, with the National Institute for Play in Monterey, California taking a leading role in growing awareness of the vital role of play in public health. The institute's website describes play as "the gateway to vitality". "By its nature it is uniquely and intrinsically rewarding. It generates optimism, seeks out novelty, makes perseverance fun, leads to mastery, gives the immune system a bounce, fosters empathy and promotes a sense of belonging and community. Each of these play by-products are indices of personal health, and their shortage predicts impending health problems and personal fragility," it adds. The institute's founder is psychiatrist Stuart Brown, who was in town recently to speak at The Straits Times Education Forum. In an earlier interview, Dr Brown, who is also a consulting professor at Stanford University, had defined play as an activity that "appears purposeless". "Go to the Oxford dictionary," he said, "and you'll find at least 50 definitions, but to start with I'd say play is anything that spontaneously is done for its own sake. And then one can extend that into more and more detailed definitions such as 'appears purposeless', 'produces pleasure and joy', 'leads one to the next stage of mastery'. In terms of biology, it appears to be the product of what I call 'divinely superfluous neurons'." He also stressed that in play, the person involved must feel he has a choice whether or not to engage in the activity. "There is choice in the player's life. And that choice, if given opportunities through the environment, emerges innately and spontaneously if the individual, or animal for that matter, that's capable of playing is safe and well fed." When the interviewer pointed out to him that there were parts of American culture that would have difficulty with anything that appeared purposeless, Dr Brown replied that he hoped to encourage more people to engage in "a little guilt-free purposelessness". A telling sign of where Singapore stands on that emerged during the ST forum when there was a discussion on "purposeful play", which the Ministry of Education has included as a key component of its pre-school curriculum. Dr Brown cautioned that for purposeful play to work, it is important that the child not be pressured to act in a specific way. "If there is teacher pressure towards a specific performance, that squelches the intrinsic motivation, exploration and curiosity (of the child)," he said. He also made a pitch for free play, which he has spent years studying for its effects on early childhood development, and which he believes develops traits such as empathy and reasonable risk-taking. As a born-and-bred Singaporean, I must say this is not a society that encourages playfulness. And even though I was blessed with a childhood that brimmed with play, I forgot how to as I became an adult. It took a 10-month-long sabbatical at Stanford - on a journalism fellowship that led to no degree - to revive my playfulness. There I met friends who showed me that a day playing ultimate frisbee on the beach at Half-moon Bay as the tide rolled in, the sun sank below the horizon and our shadows lengthened, was a day well spent. So if you can't remember the last time you spontaneously did something for its own sake because it brings you pleasure and joy, you are overdue for a play break; and if you have children, they probably need one too.